It's planning and goal setting time again! Yvonne, of Quilting Jetgirl, is hosting her annual Planning Party to help us all set goals and make plans for the amazing things we hope to accomplish in 2019. Will you be joining the party? Since I didn't actually set goals for 2018, I won't start off by assessing my progress on those 😊 We'll just say that I feel like I accomplished a lot, especially since I finally (finally!) achieved my goal of printing my patterns and getting them into shops. There's still so much work to be done on the getting into shops part, but at least I have some printed patterns to offer them and you, if you prefer the printed version over the PDF. 1. Finish the first responder quilts!! Nathan seems to enjoy reminding me that the fire at the Manor happened "two years ago" even though it was actually only 19 months ago. Sheesh. Those quilts really need to be finished, both so our town's first responders can actually use them and so they (and their various parts) are no longer taking up space in my house. This goal is a priority, but somehow still has to fit in around my quilts with deadlines. Ideally, I'd like to be finished before Nathan is right about the two years thing. That gives me a deadline of April 6. 2. Participate in the OMG link ups to finish up some WIPs. One of many projects that need finishing. This is destined to be a pillow cover, once it's quilted. I've known about and been interested in the One Monthly Goal link up at Elm Street Quilts for a while now, but I've never participated. Well, I've decided that the WIP situation is getting out of hand and it's time to start finding some motivation to get things done rather than always jumping immediately on to the next new thing. It seems like setting one goal per month would be a good way to tackle some WIPs without getting overwhelmed, so that's what I'm going to do. As a bonus, I can use some of the early months to help me meet goal #1! I'm pretty excited about this one! 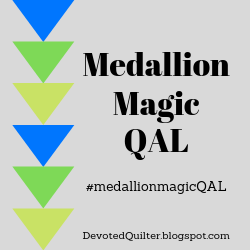 As I said on Wednesday, I'm going to host a QAL featuring my Medallion Magic quilt starting in January. 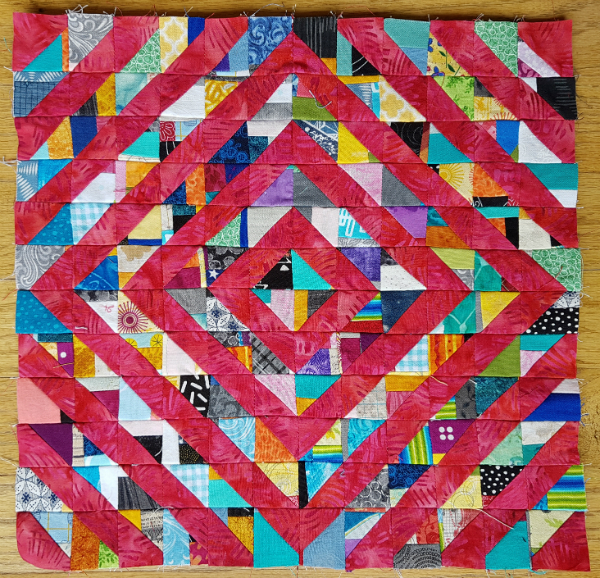 I may be the last blogger in the quilt world to share about their QAL plans for the new year, but better late than never, right? Hopefully you haven't completely filled your QAL dance card and you'll be able to participate in one more. The PDF pattern is now available from either my Etsy or Payhip shops and the print patterns will be available in the new year. 4. Have a table at our local spring craft fair. There's a small craft fair here in town every spring and fall. Now that I'm printing my patterns, I plan to have a table come spring. Of course, that means I'll need to have quite a few different patterns printed by then. A table with only four quilt patterns on offer probably wouldn't result in many sales. I plan to update my existing patterns to get them ready for printing, plus I have a backlog of new patterns that I haven't released yet, so it's only a matter of finding the time to get to them all. Why are there not more hours in the day?? After trying the spring craft fair, I'll decide what I want to do about the fall. Will I have a table again? Will I look at going to one or more of the much larger craft fairs that are around? I'll know a lot more once I see how I do here, though this small market may not necessarily be a good indication of what a larger one would be like. Still, it's a place to start and I know there are quite a few quilters in the area. With no established sewing room, I have sewing stuff everywhere in the house. Earlier this year I bought some shelves for the spare room to contain some of it, but there's still more work to be done. I also now have patterns to be storing (somewhere!) and a big box of bags for packaging the patterns. There's plenty of stuff in the house that could be cleared out, it's just that I don't usually want to spend my time decluttering when I could be sewing 😊 Please tell me you can relate! I also need to find a better way to keep track of my current and upcoming quilt projects, especially the ones with deadlines. I've never missed a deadline, but I feel like I could have a better handle on keeping everything straight and knowing how much I've committed to, which will be helpful when I'm deciding whether or not to commit to something new. Well, that should certainly keep me busy, don't you think? Especially since I didn't mention the Island Batik ambassador challenges, which I'll be doing again if I'm chosen as an ambassador for another year (fingers crossed). I'm also involved in a few blog hops in the first part of the year, so I'll be making for those of course. And there are so many design ideas I want to make...You know how it is! What are your plans/goals for next year? Note - this post contains affiliate links which means that if you click on the link and then make a purchase I may receive a small commission. This does not affect the price you pay. Wonderful goals. I also have been working on WIPs and UFOs all year. 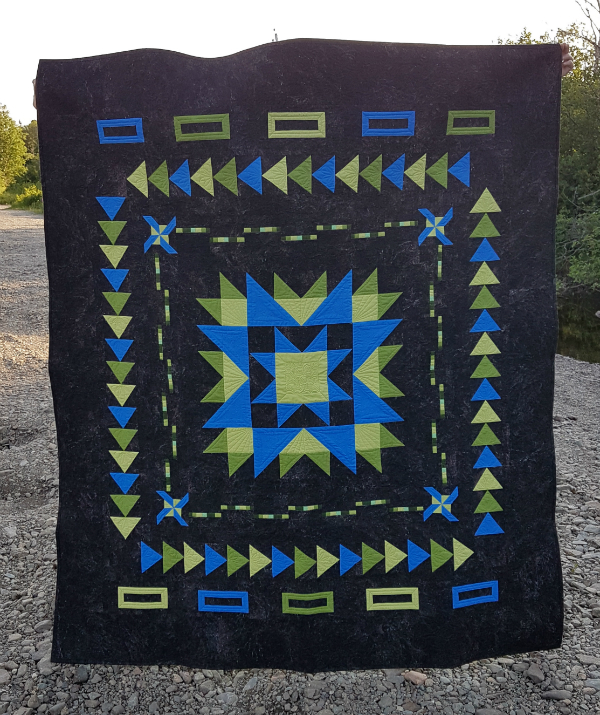 Your Medallion Magic pattern and quilt are gorgeous, and will be in that QAL for sure. Happy holiday blessings. Planning is good. Setting goals is good. I do both. Often. But following through. Now that's where I need to focus. 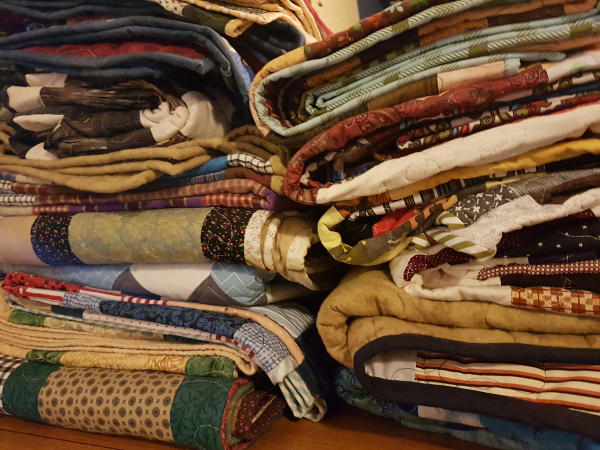 I am so spoiled because I have a very large (and cluttered with way too much stuff) quilt room as well as a cupboard and closet full of quilty stuff. Good luck being chosen again as an Island Batik ambassador. I have really enjoyed seeing what you did each month. Great set of goals! I feel like organizing is half the battle. Wonderful Goals! You got this! Wonderful goals! I think that you are going to have a fulfilling and fun 2019! Great goals! Looking forward to seeing your quilt along, too. Organizing is everyone's weak spot, I think. I try to be really organized myself, but creativity is messy! Merry Christmas and best wishes for a great 2019! Good luck with your goals. . . organizing is high on my priority list also. Hope 2019 sees you get ahead of the game. You have some challenging goals. Hosting a QAL would be way beyond my skills and time table. Good luck with your goals in 2019! I'm not a goal setter when it comes to quilting, but I sure do like how you've laid out your plans. You have a little of everything from projects, to space issues to relational quilting. Looks like it will be a great year for you. Enjoy! These are great goals for you Leanne. I'm interested in following your journey as you work through them.